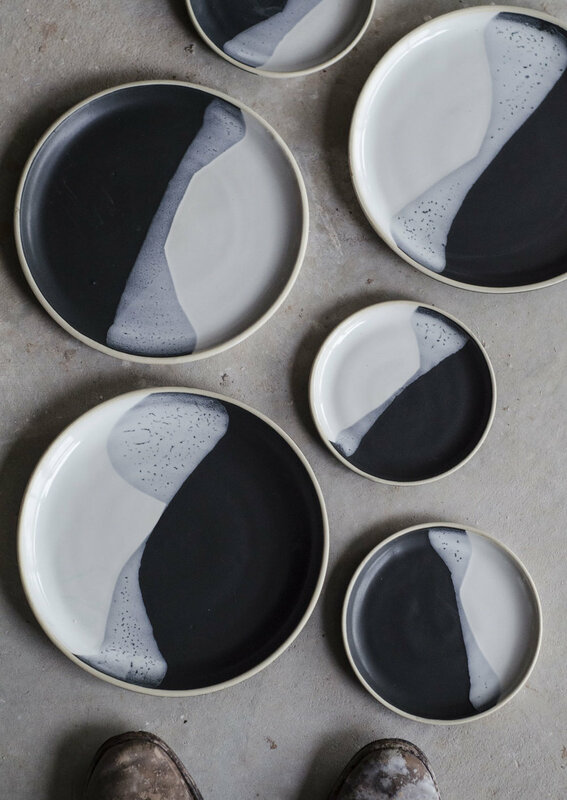 Rose Line Pottery is Travis Sudweeks, hey there! I’ve been making pottery for most of my life. Even when I first started I felt the desire to make it my life and career, but I didn’t understand how to do that until 2016 after taking a pottery class with my wife, and saying to myself, I can do this, now is the time. So I studied up to see if and how other potters were doing it. I found that there were quite a few full time potters around the world, that only work for themselves, making collections and artistic pieces that they want to make, while taking in to consideration what others enjoyed in pottery. I was inspired by seeing their success. So I took the plunge, as my wife patiently looked on, I set up my first studio in a 100 sq ft closet, in our fourth floor apartment, with no elevator. Every day I threw, and threw and threw more. I knew I had to get as good as I could as quickly as possible, so I could start selling. I also learned as quickly as possible how to market, how to sell, how to build my website, email list, get wholesale clients, and everything to do with running your own small pottery business. I’m still learning these things as I type this. Back to my apartment studio. To fire my pottery I would pack delicately in boxes down those four flights of stairs and drive it a few miles to the community studio where I fired and did my glazing. I also brought home 50 pound boxes of clay, and other supplies all the way up those four flights of stairs. I was up and down those stairs 20 times a day. I kind of miss those stairs. Quickly I saw my pottery getting better, even though I didn’t have a clear design or collection style. I tried all kinds of techniques, I brainstormed on what shapes would sell best, and how to sell them, fire them, glaze them. I’ve always loved clean, minimal, modern design, and I’ve found that style to be what I continue to go back to. In the past few years I have made thousands of pieces, lots of them finding the garbage, but many also finding a home. I have also moved studios two more times and now have converted my home garage into my studio. This past winter was my first here, and it was so cold, I froze, my pottery froze, and I have no water, or heat, but I made it through, and I am vowing to find a new studio by the beginning of next winter. I am now to the point of releasing Collections that will include cups, mugs, saucers, plates, creamers, oil bottles, vases, and more. I am very excited to present these collections to you. I will be selling them through Shop Updates every few months. Sign up to receive Shop Updates!